On the list of foods which american expats living in europe miss, good hamburgers rank somewhere near the top (usually right below Mexican food). Now, you’ll notice that I specified good hamburgers, because bad and mediocre hamburgers are quite easy to find. Here in Frankfurt we have several McDonalds outposts and an “american” restaurant named Chicago Meatpackers, which serves up rubbery gray patties to unsuspecting Germans who no doubt go home confirmed in their belief that all american food is terrible. (And in case any curious locals are reading this, my extensive research into the subject has found very good burgers at O’Reilly’s Irish Pub across the street from the main train station.) Yet, in all my efforts to find a good burger in Frankfurt, it never once occurred to me to make my own. Why is that I wonder? 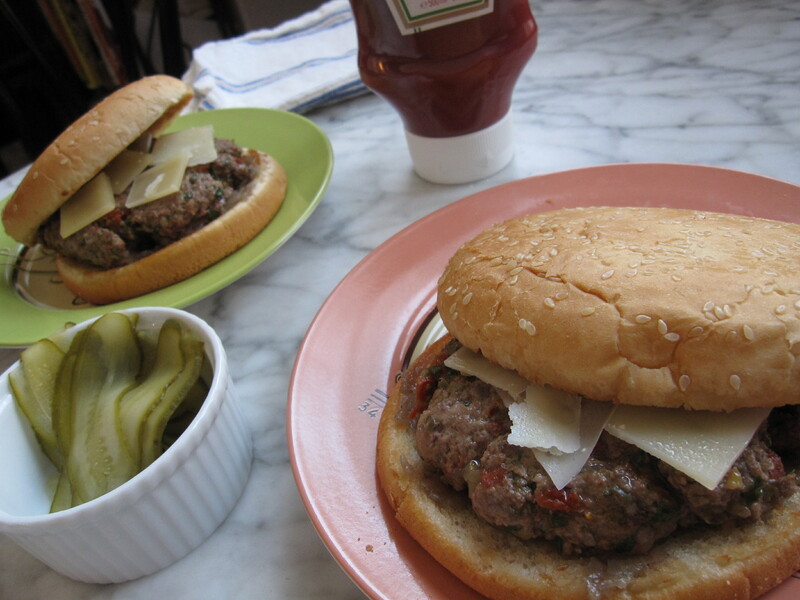 In fact, this week’s French Fridays with Dorie recipe, the Cafe Salle Pleyel Hamburger, is the first burger I have ever made. According to Dorie, this burger was created by a Paris chef as a french take on the traditional american hamburger. The recipe (published here in the New York Times) starts out with the traditional american basics, a sesame seed bun and dill pickles, but then veers quickly into french territory with an onion marmalade, sun dried tomatoes, capers, cornichons, and tarragon. In fact, I was very much reminded of a classic bistro steak tartar as I was gathering the ingredients for this parisian burger. It may seem weird to say, but as good as these burgers were, they just didn’t satisfy my expat craving. My husband loved them (but he’s european so…), but it seems that this american is a bit of a purist when it comes to burgers and I found all the extra ingredients to be distracting. In short, Dorie’s is a very good hamburger recipe and I’m glad that I tried it, but it’s unlikely that I will make them again. I guess some recipes simply should not be tinkered with. Yes I found these very European and I reckon many North Americans might not like this at all. I loved seeing the potential those ingredients have mixed with a little beef. Am thinking meatloas sometime soon! Yes, they reminded me exactly of a meatloaf, in fact I think this recipe would probably make a very good meatloaf. Hhmm, something to consider. Sorry to hear that these weren’t the burgers for you. I am impressed that you have hunted for the best burgers in Frankfurt. I liked these, though they are not what I would usually choose to make. It did take some time but I can confirm that good burgers are to be had in my little corner of Germany, you just have to know where to go. I agree that this recipe wouldn’t satisfy a burger craving for me, but I very much enjoyed it if I didn’t define it as a burger. My husband agreed with you…just give him a plain old American hamburger. I really enjoyed all the flavors that were going on here. Your burgers look great! What a lovely task to undertake…finding the best burger in Europe! I loved this but I like making all sorts of wildly different burgers at home. I’d say this is on par with some type of meatball or meatloaf, but…now you see it is easy to make a burger so go for it. That is what this Dorie cooking is all about. You’ve made your first burger and now you will want to make a good, American hamburger yourself. Very true, this will definitely not be my last effort at making burgers. I think the flavors were delicious in this burger, but I probably won’t be replacing my staple recipe. They were good for a fancier affair, though. We loved these, too! Bistro-style is the way most Doristas are so aptly describing them. I had to laugh when I read your comment about Mexican food – I grew up in Italy and my uncle in CA went to great trouble & expense to send us a huge box of tortillas, refried beans, etc. , which was really wonderful except that we could get them at the Navy Commisary! It was truly a case of “It’s the thought that counts!”. What was really surprising to me was that when we moved to NJ from Rome, we couldn’t find tortillas anywhere! What a sweet story, you are right, in this case it was the thought which counted. They look delicious, I did enjoy them but there is nothing like a good old cheeseburger!! Steak tartar! Keen observation you made there. That’s why I love the taste so much. I’m sorry you didn’t like it. We did like them, but I think we have been so ready for a change from the regular hamburgers that we eat here. I think you and I are in agreement! It was tasty enough, but I didn’t satisfy that yummy, juicy, messy burger craving! Congratulations on making your first burger. Making a plain old American burger is even easier, so you’re on your way! I didn’t love these either, but you never know until you try. It’s sadly true, while there is lots of very good food over here, good Mexican food is not to be found. In fact, it is even difficult to find the necessary ingredients with which to make it at home. I can appreciate the hamburger purist in you. Our favorite local burger comes from the Library (a local steakhouse that’s been around forever it seems). We always order their burgers which are pure, ground steak, heavenly. Pure heaven. Someone suggested using this recipe as a meatloaf, I really like that idea. I liked this burger but think it’d be better as a meatloaf after giving it some thought. sliders and give Tricia a taste of this week’s recipe. At least you now have the basics down to make a really good homemade burger. I really like those whole grain buns. This is definitely a variation on burgers, not the “ur” burger at all. So, for those of us who have regular burgers regularly available, this is a nice treat, but for someone missing food from home, I can see why it didn’t do it for you. Yes, that exactly! It’s not that this burger recipe was bad, it just wasn’t the burger from home which elicits cravings. Love your post! Having lived for a while in both the UK and Australia, I totally hear you! I remember taking powdered chiles back in my bag one time… It exploded and I had hot chile powder in everything! I was often asked to make Mexican food or “Thanksgiving”. Your post brought back great memories. Plus, I really liked your comments on the burgers. Good job! How funny – David Lebovitz book was the first one I bought, too! In fact, this coffee ice cream is the only recipe I’ve made that wasn’t from his book. Enjoy!